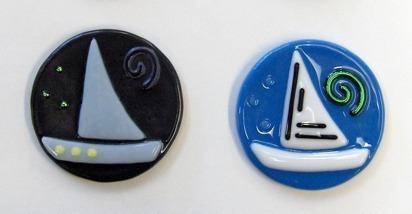 Sailboat magnets. Available on black or blue base color. Sailboat designs will vary but all are cool! Order either with magnet or velcro. $16.95 ea and includes shipping. 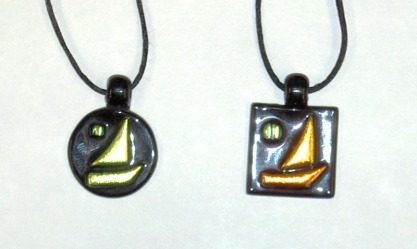 Dichroic sailboat pendants on black glass. These are one of my best selling pendants! Each pendant will vary as dichroic glass is very unique. I fuse a glass bail onto these which is better than metal glued on bails. Soft 16" cord also included. Please specifiy either round or square pendant.